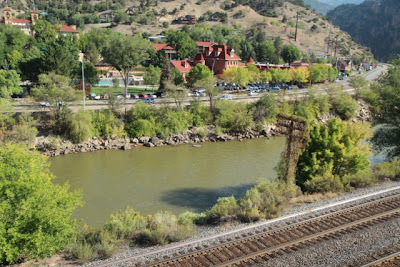 In the morning we walked across the pedestrian bridge over the Colorado River into the town of Glenwood Springs, straight to a coffee house, which turned out to serve low-quality latte. We considered various restaurants where we might eat if we came back to spend a few days some other time. Thus, we didn't get out of there until noon. Leaving Glenwood Springs, the road goes through a narrow canyon where lanes going one way are raised above lanes going the other, passing the Colorado River and the railroad. Later the hills were covered with a mix of golden aspen and dark fir trees. Vail summit is 10,600 feet. The town of Vail and the surrounding valley is populated by impressive private homes and huge, luxury condo developments. Eisenhower tunnel is 11, 158 feet in elevation and really long. The whole highway is an engineering marvel. Arrived in Denver about 3:30. In the past, we have had difficulties with our accommodations in Denver. On two visits we stayed at a cheap motel on the edge of town where the room was sub-standard, and you could say the same about the guests. On the second visit, a major fight erupted a couple of doors down with prolonged screaming and swearing, and finally a broken window that brought the police. For the third visit, we decided to stay downtown, right near the art museum, in a motel recommended by the Denver tourism guide, that was, I admit, suspiciously cheap. When we got there, the property was so run-down, unclean, and insecure, that we departed immediately, feeling slimed. It was about 80 degrees at 6 p.m. and all the hotels downtown, and for miles around, were occupied because of a beer convention. We kept stopping at hotels farther and farther away, until we finally found a room at the Hilton Garden Inn in the Denver Tech Center, which is about 25 minutes from the art museums. This was not too bad because it is right near a freeway, and it is a very nice property, so we decided to stay there again this time. The Hilton Garden Inn has a nice pool, about 20 feet long, and about the same temperature as the hot springs pool. Instead of sulfur, you have chlorine, which feels and smells a little fresher. Dan and I swam a half hour, having the pool to ourselves most of the time. From our hotel we walked through Denver Tech Center, a mix of office buildings and large hotels, to Garcia's Mexican restaurant. This was one of those phony corporate joints, but the wait staff was actually Mexican and willing to work with us to get a more authentic meal. Dan had a small steak. I had some sort of salad, per usual. On the way back to our hotel, we stopped at the huge Marriott where they were having an Animé convention. Animé is a Japanese form of animated video. What we saw was participants dressed as characters from their favorite stories. They looked quite bizarre, but they seemed shy somehow, and rather serious about the whole deal.